With the sweetness of the Lakers' third consecutive championship comes the complacency that all is right in the world ... the same safe, smugness that we have all known for more than 40 years. In those 40 years we have all come to rely on Chick Hearn as the steadying, compassionate voice that has delivered us to safety and the promised land day after day. Today, things are different -- very different. Today is the day that, for the first time, Chick needs us. Today is the day that we realize how much this true genius of the human spirit means to us. Growing up in a non-athletic household without a television set, my imagination was driven by books, newspapers and my small, hand held transistor radio. As I collapsed into bed on a nightly basis --- my dreams of endless games having been fulfilled -- I convinced my parents that I was, indeed, packing it in for the evening and, with a good night's sleep, that I would be ready for more tomorrow. Little did they know that that is when the real action began for me. Under the covers, under the pillow, it was the beginning of my most exciting love affair ... and only 10 years old ... Chick, the world and me ... what could ever be better? I had no idea where this would all lead, that things would only get better. No concept that the games would go on forever ... and certainly no comprehension of the impact that the special voice on the other end of that radio would have on my life. Chick Hearn taught me how to play basketball. He also taught me how to think about the game, ultimately showing me how to love a world that has become my life ... or so I thought. It wasn't until the years started to add up and I began to learn all the things I was so sure I already knew that I realized that Chick was teaching me the game of life the whole time. There was nothing better in life than growing up with the comforting solace that Chick was your best friend ... knowing that at the end of the day, Chick would be there with more. The creativity, the excitement, the intensity, the exuberance, the vibrancy, the joy, the openness, the honesty, the personal touch -- I always knew that he was speaking directly to me. ... I lived through Chick. ... Ultimately, I lived for him. There was nothing that Chick could not do. He was the perfect artist who could take the dark out of the nighttime and paint the daytime black. Like any best friend, Chick was always about you. He never asked, he always gave. He never whined, complained or made excuses. He simply made things better ... always with a smile, a beaming presence and that sense of confidence, dignity and integrity that everything would be all right. The stories, legends and anecdotes about Chick are endless. They also cover every aspect of humanity. 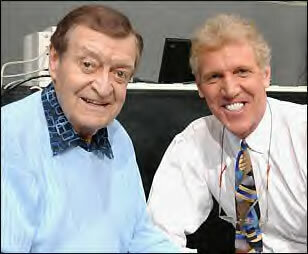 On or off the air, Chick was the consummate professional. He was always there, always right. He was so good he became your dad. He always delivered the greatest messages of hope, optimism and happiness as if that was the nature of all things. And on the rarest of cloudy days when the news was bleak, Chick had the singularly unique ability to push back the grim fog and clouds to unveil, once again, yet another perfect day. I steadfastly planned my days, my years, heck, my life around my best friend. I knew ... I had been there before and I wanted more, I wanted it all ... I learned what I wanted and I knew where to get it. I was never disappointed. From the beginning, Chick was able to deliver peak performance on command --- always at his best, somehow always rising, never dipping or dropping the ball. It always seemed so easy, so effortless, belying the eternity that he spent selflessly perfecting himself for me. My best friend was a pillar of strength and stability who carried the weight of the world on his immense shoulders. With all the nonsense, absurdity and crazed madness regularly swirling about, Chick always stood erect, proud and true in the face of the most extreme adversity and devastating personal tragedy. He never gave anyone the sense or satisfaction that the universe wasn't in perfect harmony. Chick gave all of us everything that he ever had. He never held back. He never looked back. It seems like yesterday, still under the pillow with the transistor: the message, the dream, the work ethic, the perfection, the difference, the persona, the life, the world, the universe. No one has ever given us more -- yet that is all we want on this first lonely day in more than 40 years. That is what best friends are all about. Hall of Famer Bill Walton was a three-time NCAA Player of the Year and a member of UCLA's undefeated NCAA championship teams in 1972 and 1973. The first overall pick of the 1974 NBA Draft, Walton led the Portland Trail Blazers to the NBA title in 1977 and was also a member of the Boston Celtics championship squad in 1986. Walton was recently named lead NBA analyst for ABC and ESPN.